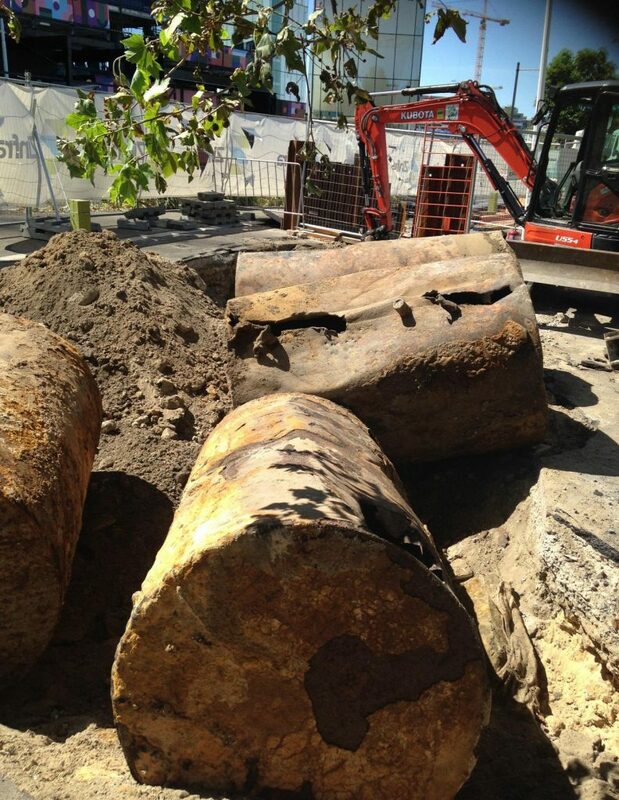 AES was commissioned by our client to decommission 4 underground storage tanks (USTs) near Green Square (Sydney) NSW. The USTs were located at a busy intersection in Green Square, Sydney with limited space on site. High voltage electricity services were located on the adjacent footpath. Pedestrian movement past the site was considerable and required the engagement of pedestrian control personnel. After conducting a site walk over with our Client and listening to their scheduling and outcome requirements AES assisted in developing a scope of works that met all regulatory requirements. As the identification of the USTs was an unexpected find it was critical to our client that AES reacted promptly to their needs. AES responded by providing our client with a lump sum proposal shortly afterwards and had resourced personnel to mobilise the following day. After mobilising to site AES’ Site Supervisor conducted investigative excavation works to determine if there were any further USTs onsite (excavation area had previously been cleared of any underground services). In total three (3) additional USTs were identified. AES’ personnel then established an exclusion zone around the works and then commenced monitoring the atmosphere to ensure that no works occurred within an explosive atmosphere. The overburden to the top of the USTs was then excavated and stockpiled onsite (material placed upon the impermeable hard stand, environmental controls confirmed). Once the top of the USTs where exposed tHen the liquid waste within the USTs (oily water) was removed by means of vacuum truck and disposed of offsite to an appropriately licensed liquid waste facility). AES then commenced degassing the USTs by air purging the tanks. After ensuring that the controls preventing static discharge were in place, the USTs were individually degassed until LEL levels were confirmed as being less than 5%. The USTs were then destroyed onsite. Once destroyed the USTs were legally disposed of to a metal recycling facility. In this project, the Client then took over from AES to undertake soil classification and validation works and AES demobilised from the site. Our Client benefitted by engaging AES to undertake the works by minimising the amount of lost time to their primary works schedule. AES was able to mobilise experienced personnel to site the day after meeting our Client onsite. 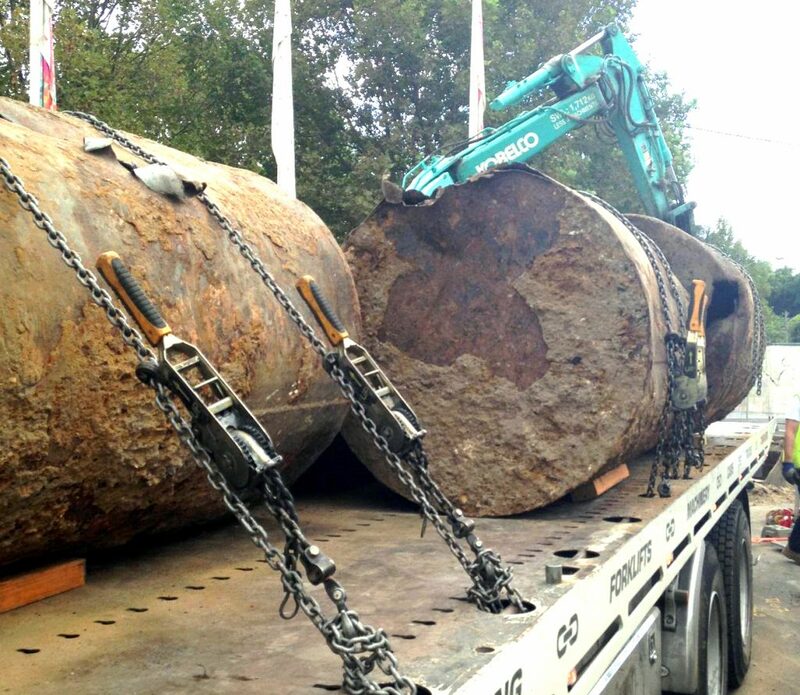 AES personnel identified additional tanks that prevented further mobilisation and delays to our Client. UST was destroyed onsite resulting in commercial savings for our Client. All works were conducted safely and as per our proposal costs. Australian Enviro Services are experienced in underground storage tank removal. You can find more information about our tank removal services on these pages: UNDERGROUND STORAGE TANK REMOVAL | STORAGE TANK REMOVAL PROCESS | FUEL TANK REMEDIATION SERVICES | TANK REMOVAL EXPERIENCE. We are also experienced in Asbestos Removal in and around Sydney.